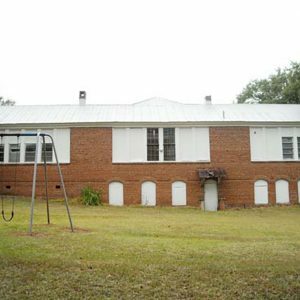 This school, built in 1934, replaced the Ridge Hill Rosenwald School, a six-classroom frame school built in 1923-24. This new school was built on the sale plan, at a cost of about $8000. Grades 1-11 attended this school until grade 12 was added in 1947. Ridge Hill School closed in 1957. This building has been the Ridge Spring Star Community Center since 1978. The chimney nearby is all that remains of a Faith Cabin Library, part of a program founded in 1932 to help give small-town and rural African Americans better access to books. The library built here in 1934 was the second Faith Cabin Library in the state.